Three years ago, scientists discovered electric currents running through the seabed — but they had no idea what was causing it. But now, researchers from Denmark and the United States believe they have the answer: bacteria that function as living electric cables. In a remarkable case of biological engineering, scientists have confirmed that each tiny section of the bacteria contains a bundle of insulated wires that leads an electric current from one end to the other. The discovery could lead to an entirely new class of organic electronics — including devices that could be implanted in the human body. According to Nils Risgaard-Petersen, Christian Pfeffer, and their colleagues at Aarhus University, they started to suspect that something was up when they noticed the appearance of a previously unknown type of long, multi-cellular bacteria. 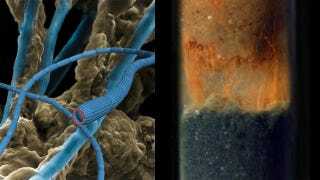 These bacteria were always present when electric currents were around. Moreover, they could disrupt the currents when they pulled a thin wire through the seabed — a possible indication of broken connections. Looking at it more closely, they noticed that the bacteria, which is a hundred times thinner than a human hair, contained nanoscale strings that were enclosed by a membrane. They concluded that the entire organism functions as a virtual electric cable — insulating wires and all. And indeed, the researchers note that the structure is very similar to the electric cables that we use on a daily basis. The researchers theorize that the adaptation gives the bacterium a distinct advantage over other oceanic microbes. Collectively, when they sit in an undisturbed seabed, they extend tens of thousands of kilometers of cable within a single square meter (10.76 square feet). Their ability to conduct a current allows them to pull in vast amounts of energy that's put out through seabed decomposition. And in fact, a single teaspoon of mud can contain as much of one kilometer of living electric cables. Another unique characteristic of the bacteria is that it can maintain efficient combustion in the oxygen-free part of the seabed. It does this by forming a chain where one individual bacterium extends out into the oxygen-rich area of the seawater; all that's required is a few millimeters. When the combustion happens, there is a transfer of the electrons of the food to oxygen. The bacteria manage this transfer over a distance of about a centimeter. And like any electric cable, any disturbance can lead to a fatal breakage — and an end to the current. Looking to the future, the new insight could inspire developments in the nascent field of organic electronics. Assuming that a similar kind of bacteria (or other microorganisms) can be engineered, these biological systems could be used to conduct currents in advanced electronic devices, or even in prosthetic devices for humans. Check out the entire study in Nature.